If Mitt Romney is the Good Cop, who’s his Bad Cop? We’re big fans of quality discourse here at Overthinking It, which is why we’re looking forward so much to the upcoming US presidential campaign! Riiiiight. So while we normally try to avoid the touchy subject of politics on this site, we acknowledge that during campaign season, the presidential race saturate pop culture in a way that can’t be ignored and that we have a special obligation to our readers to try to elevate said level of discourse, at least a little bit. Failing that, we will at least try to make you laugh with pop culture-related political humor. As we pointed out back in 2008, what makes a good president-vice president pairing is a lot like what makes a good buddy cop pairing: enough contrasting personality traits to allow one to make up for the other’s weaknesses, and enough hilarious personality clashes to keep things entertaining. 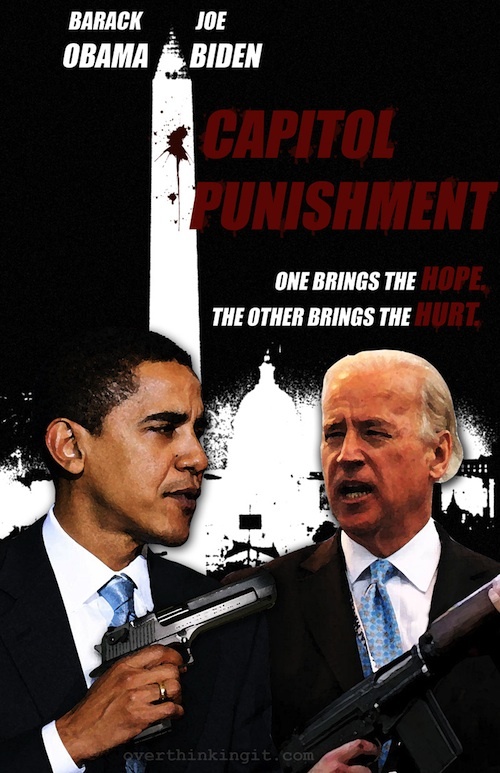 Some of you may recall that in 2008, we denied the Republican ticket the badass buddy cop movie poster treatment and went with a romance novel instead. Although I still insist that I would totally read the heck out of The Maverick and the Maiden (by Karla Rovelace), some may accuse of bias based on this discrepancy. 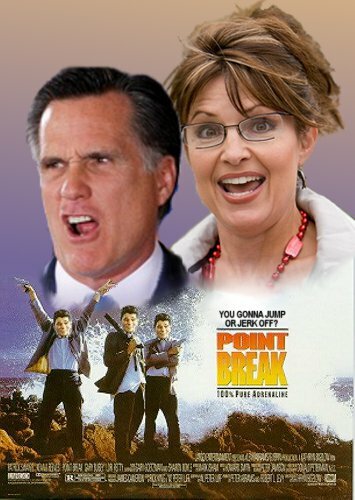 Four years later, I’m going to make up for it by giving you not one, but two badass Mitt Romney buddy cop movie posters to help his campaign make this big choice with the appropriate analytical framework. Christie’s blustery style contrasts well with Romney’s measured, perfectly enunciated tone. 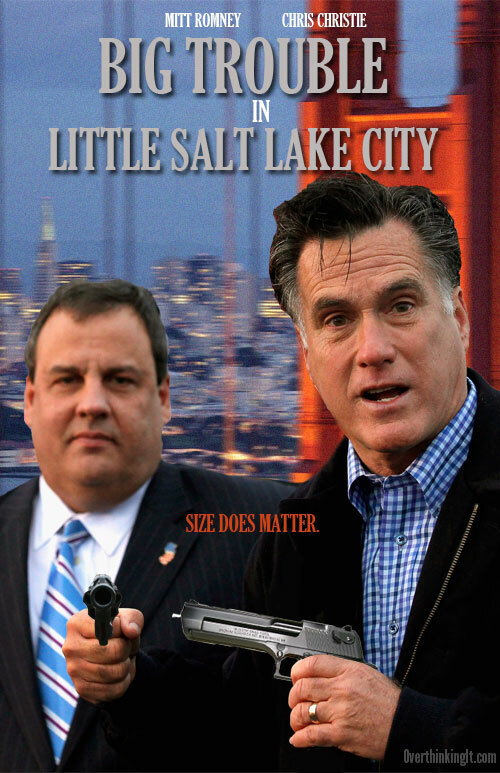 In other words, Romney is the Good Cop; Christie is the Bad Cop. Interrogation scenes will be a mixture of reasonable pleas for cooperation with multiple citations of Harvard Business School case studies and rage-induced tirades. And the different body types will make for some hilarious physical humor when Christie fails to follow Mitt’s doorless leap into a convertible. Christie’s size will ultimately be an asset to him, as it will allow him to use his catchphrase, “size does matter,” before killing the villain at the end. Coconuts may or may not be low hanging fruit on Florida’s palm trees, but this joke certainly was. In case you’re not getting it, Marco Rubio is a Senator from Florida and lived in Miami prior to his election to the Senate. Anyway, Rubio contrasts with Romney in one important ways that Christie does not: ethnicity. Truly great buddy cop pairings, like Glover/Gibson and Obama/Biden, remind us that if two stubborn cops from different backgrounds can learn to trust each other, then maybe we can, too. Rubio’s exotic Cuban culture will clash horribly with Romney’s staid Caucasian ways at first. Rubio will smoke cigars and insist on blaring loud salsa music from their cop cruiser’s stereo; Romney will make insensitive comments about “you people” taking jobs from “real Americans.” But eventually they’ll overcome their differences. 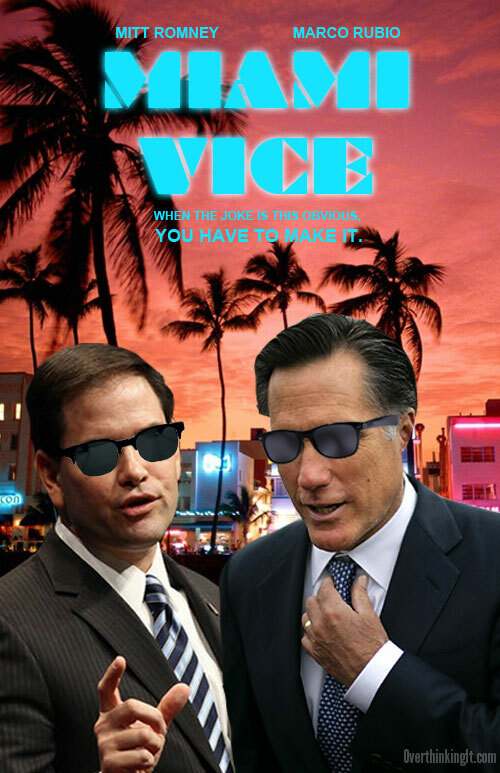 Mitt will learn how to pronounce and enjoy “Cubano” sandwiches; Rubio will learn to turn the radio down when staking out suspects. At the end they’ll shun a hottub full of beautiful beach babes, content in their newfound bromance. 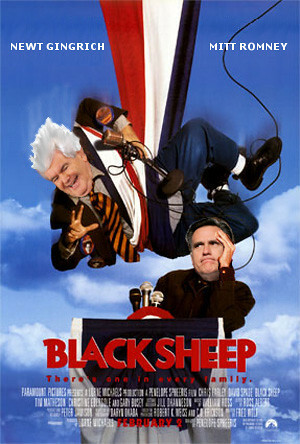 Got ideas for other buddy cop pairings for Mitt Romney? Ideally ones with awesome catchphrase potential? Show me in the comments, either as a written description or as a link to a Photoshopped movie poster! We need to think further outside the box. What do soccer moms love more than Marco Rubio? Dogs. A canine VP and a Turner & Hooch reboot would definitely put those Seamus rumors to rest. HA! That is awesome. I fixed the image embed so everyone can see this. Fantastic. Double points for the coconut/low hanging fruit pun. Triple points for knowing that coconut is a fruit. Double word score for an in-ethnicity and out-ethnicity Romney posters. Triple letter for 80s references. Bonus 50 for having somebody in slicked hair in all three. How about a “Top Dog” reprise, with Mitt Romney in the Chuck Norris role, and Mitt’s dog strapped to the roof of the squad car? 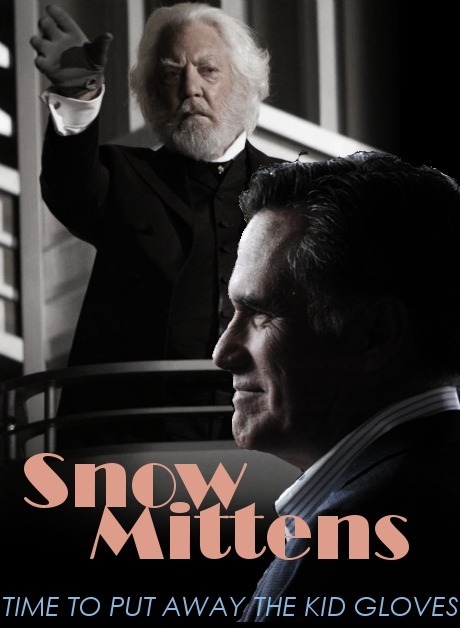 Snow-Romney 2012: May the Tax Code be Ever in Your Favor. Pretty sure y’all mean “Snowe”, amirite? Here’s another one. Warning: PG-13 tagline. And yes, in this version they are all Reagan. In reposnse to the Miami Vice pairing, Rubio is Caucasian. Hispanic is an ethinicy refering to culture and language, not a race. Those Hispanics who are not White are mostly mixed with Indian and African ancestry. Rubio ancestry is European as should be obvious by his appearance. Without going into a winding digression on the differences between race and ethnicity, you are totally correct: Rubio is ethnically Hispanic but racially Caucasian. I may have obscured this by lumping Rubio/Romney with Glover/Gibson and Obama/Biden. That being said, when it comes to buddy cop pairings, differences in race or ethnicity belong to the same “different ‘background’ = hilarity” family of pop culture tropes.